Your gift can make a difference! 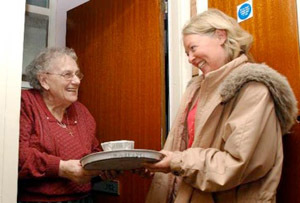 Donate to Meals on Wheels online or by mail here. MOWEOC will be closed ONLY for snow-related or blizzard conditions which also close FM and JD Schools. We will not close for temperature-related issues. We will not close if there is a 1- or 2-hour FM or JD school delay, even if it subsequently changes from a delay to a closing. Please watch local TV stations, 3, 5, 9, and 10 for updated information, or call the office. Meals on Wheels of Eastern Onondaga County is an incorporated non-profit organization whose purpose is to provide nutritionally balanced and delicious tasting food to people unable to prepare or provide healthy meals for themselves. The program operates out of the kitchen of the Good Shepherd Church in Fayetteville and typically serves over 100 clients a day. Most recipients are frail or homebound elderly, the chronically ill, the disabled or any individual in need of the service. Volunteers - More than 150 volunteers have found satisfaction in serving the community in this very hands-on way by driving, preparing food or serving on the board of directors. Good Shepherd Lutheran Church is located at 7248 Highbridge Road, Fayetteville, NY 13066. Your purchases can benefit MOW!